The top of the pyramid includes mobile medical apps that are traditional medical devices or a part or an extension of a traditional medical device. Clearly within the scope of being regulated as medical devices. The bottom section are devices that are not deemed “mobile medical apps” and, as such, have no regulatory requirements. So, FDA has reserved the term "Mobile Medical App" (MMA) to mean a medical app that meets its medical "device" definition. From now on I will have to be careful NOT to use that term/phrase when talking about mobile apps that clearly are NOT medical devices. I guess we should use "Mobile Health Apps" instead. "Among the innovative mobile medical apps we found is one that lets doctors use interactive diagrams to show patients what's happening with their bodies, where procedures will be done, and exactly what will happen during different procedures. Alternatively, patients can use this app to get doctors to provide detailed visual answers to their questions." 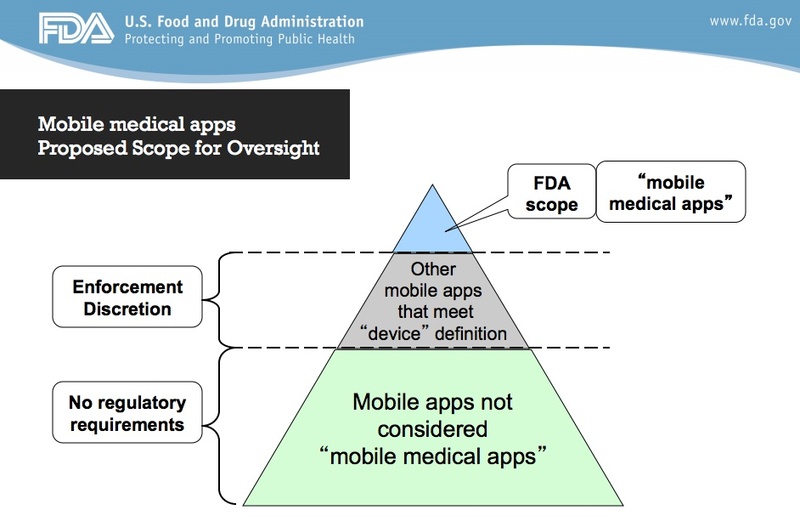 Unfortunately, FDA's co-optation of "mobile medical app" to refer to health apps requiring regulation as medical devices confuses the discussion, which up until now used the term to describe any health-related app that a physician or patient might use. This may be why PhRMA and other drug industry spokespeople are so fearful of FDA regulations hampering innovation within the "mobile health app" arena (see, for example, "FDA Mobile Regulatory Fear Mongering by PhRMA").